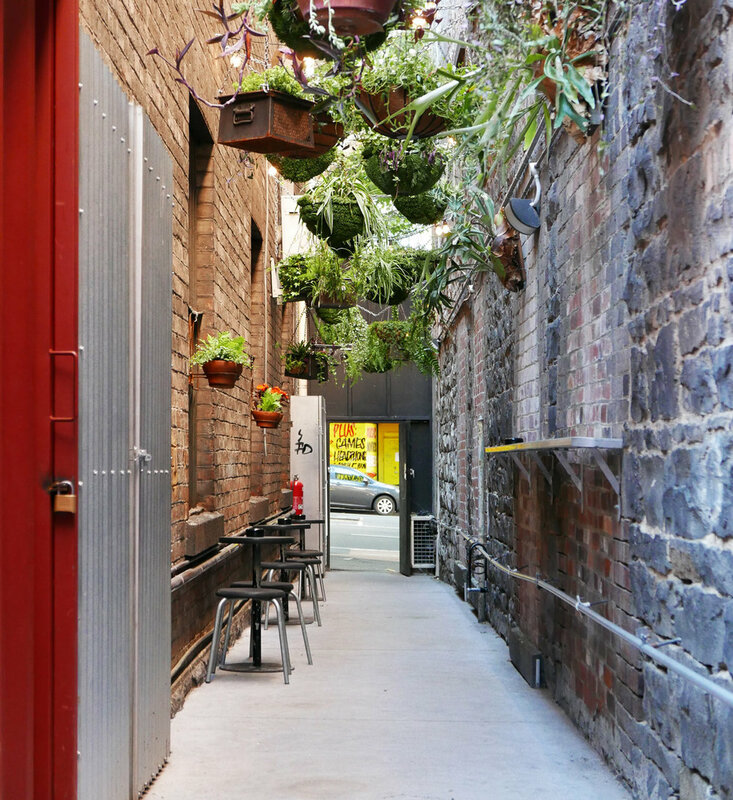 A container bar down a laneway? Could anything be more ‘Melbourne’? 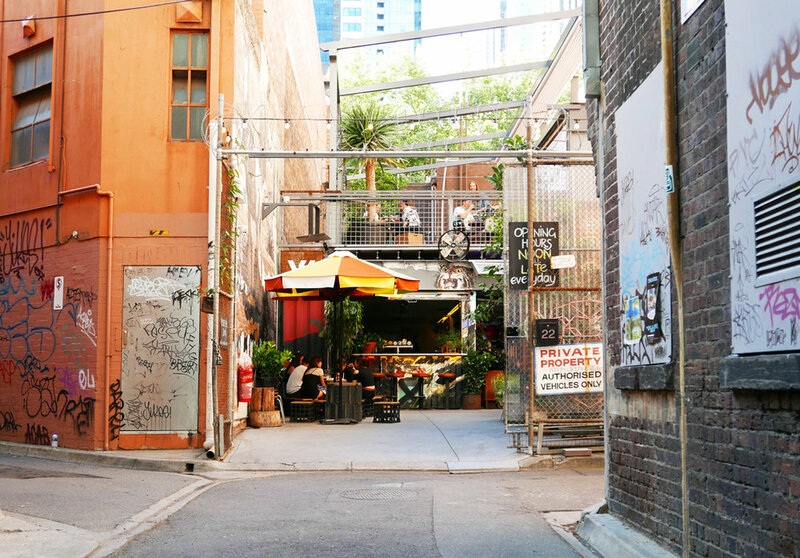 Yet compared to Section 8, one of Melbourne’s original container bars, also down a laneway, Whitehart is neat and tidy —and we’re okay with that. It’s a cool, airy space with fresh concrete (oh how we love fresh concrete) and a freight-load of cocktail options. It’s not far from Melbourne’s central GPO building, hiding behind our favourite print gallery, Outré. There are two entries but the easiest is on Lonsdale Street – via a walkway next to Michaels Camera Shop. 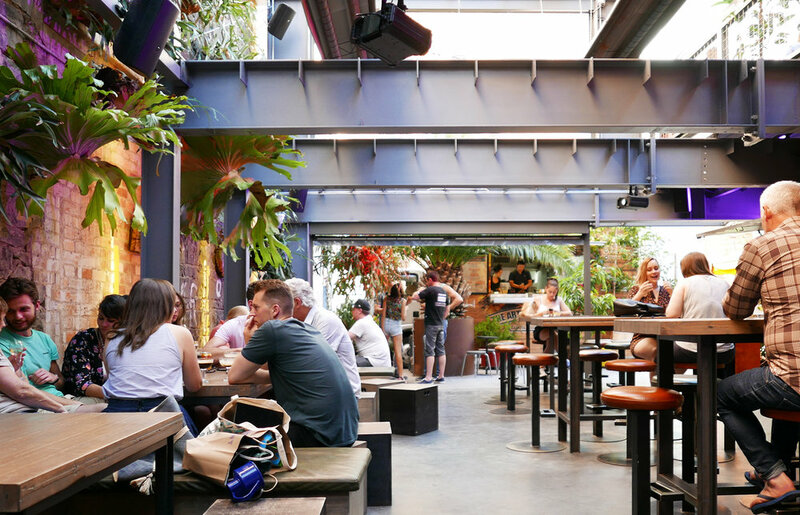 The two-storey building features girders and exposed brick, while shipping containers have been converted to house the bar, toilet and mezzanine. Accessibility is good: it’s all open space, with tables at an appropriate height and chairs along the wall. The toilet has grab-rails and good space, but the door was a bit on the heavy side. Plants, old oil drums and poster art make the atmosphere appear industrial, but the venue is nonetheless comfortable. The lighting guys have done a good job too with subtle strip lighting and soft spotlights. On our visit, manager Ken is backing up a previous late night, but still smashing out cocktails for punters left and right. Like the rest of his crew, he’s happy for us to get in the way, taking photos and asking questions. This is first and foremost a bar. After-work drinks are held here, but so too weekend revels. Food is available, supplied by guest food trucks. ‘The Art of Fried Chicken’ are on-duty when we visit, dishing up fillets, buffalo wings, sliders and fries. (A Thai truck is scheduled next month). We watch the DJ check cables and monitors, then tempt punters with his music to a cleared area. At 6pm everyone is gearing up for a good night. Roll into Whitehart and toast to Melbourne.